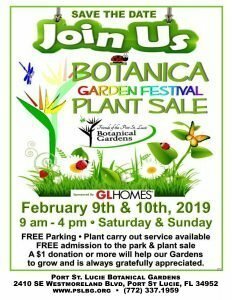 Botanica 2019 at the Port St. Lucie Botanical Gardens, 2410 SE Westmoreland Blvd., Port St. Lucie, FL. Saturday & Sunday (February 9th & 10th) from 9am to 4pm for all your outdoor and garden needs. Food, fun, live remotes with Hamp Elliott from 97.1 Ocean FM and Jazz from 12 – 2pm with the Fort Pierce Jazz & Blues Society both days.